It’s a sultry March afternoon and students at a municipal school in Santacruz East are engrossed in their lecture. It’s 4 pm already but the training session in the mobile repairing course is in full swing. Twenty-four boys and four girls of class IX are in the last leg of their course before the school breaks up for summer vacation. Clad in salwar kameez, her dupatta neatly tucked in, 14-year-old Bushra Khan’s eyes are transfixed on the motherboard of a mobile phone as she clutches a screwdriver in her hand. Bushra has completed 60 hours of class training and, after another 10 hours of institutional training with a professional and accredited institute, she will complete the necessary course hours. After this, Bushra plans to enrol in a computer training programme. The Salaam Bombay Foundation (SBF) is offering vocational courses under its ‘skills@school’ programme to many underprivileged children like Bushra. These courses equip them with necessary skills, which improve their employment prospects on completion of school and offer them an opportunity to have sustainable careers after graduation. Bushra’s father does odd jobs in plumbing, carpentry and electrical repair, while her mother does tailoring work to make ends meet. Bushra’s income helps the family in sailing through financial crises. The SBF works towards holistic growth of children for their emotional, physical and intellectual development. It gives vocational training to children in technical courses like computer and mobile repair, automobile repair, home appliance repair, robotics, web and graphic design, beauty and wellness, financial literacy, bakery and confectionery, fashion design, jewellery design and conversational English. Children continue their education and earn alongside. 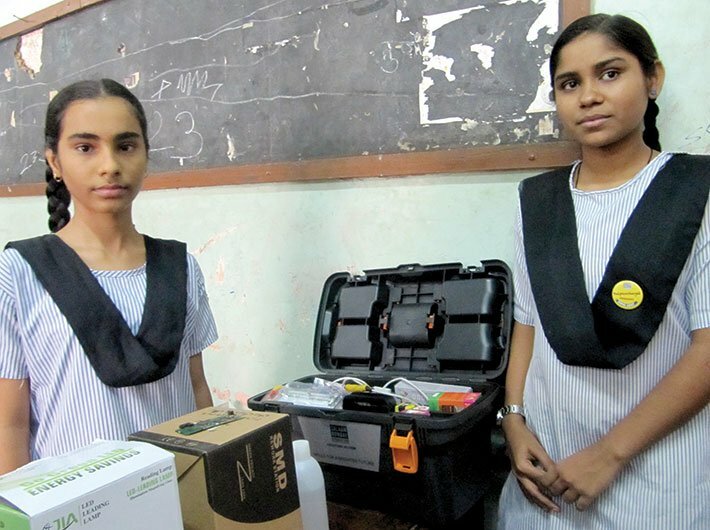 Bushra is one of the 40 girls with entrepreneurial skills who were chosen by the SBF out of 1,200 schools in Mumbai to receive professional mobile phone repairing kits. With the help of the kit, Bushra has been able to hone her skills at home and learn to work around complex technical issues. She has even become famous in the neighbourhood for her mobile repairing prowess and is the go-to person for mobile repairs in the Golibar neighbourhood. “Most mobile phones have the problem of humidity-related fungus issues,” she explains like a professional, adding that she gets immense satisfaction from her work and it has given her respect in the community. While she is good at her work and can fix most problems, she charges less than what most mobile repair shops do. Repairing a touchscreen phone, for instance, costs about Rs 1,500 at a repair shop; Bushra charges Rs 200, sourcing parts from the wholesale market. In an adjacent classroom, 32 students of class IX are undergoing beauty and wellness training; two of them are boys. Sabir Farooqui is doing make-up on his fellow classmate. He wants to own a beauty salon one day. Apart from make-up, he is also learning skills like hair dressing, saree draping and face clean-up. Like him, Kushal Sharma also wants to become a make-up artist. Sharma is inspired by his father’s friend, a make-up artist in the film industry, and wants to become a pro like him. 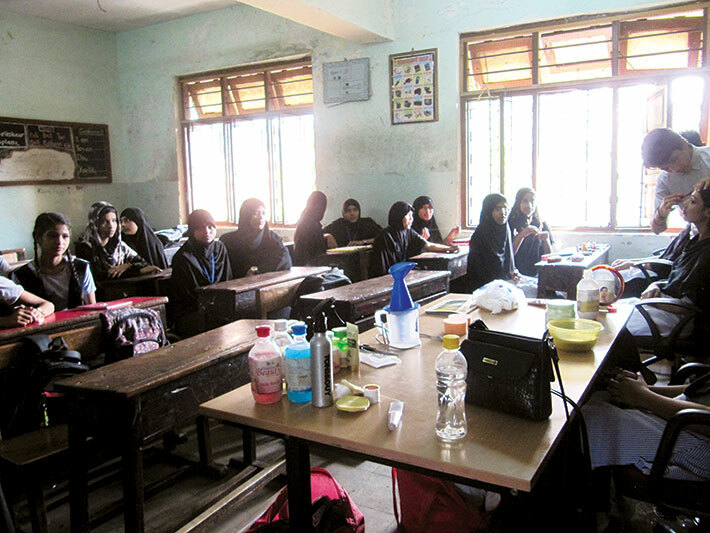 Most students in this class earn Rs 50 for a session of make-up, saree draping or mehendi application. SBF offers various vocational courses under its ‘skills@school’ programme to children from the underprivileged background. “We are trying to break the stereotypes. Many boys who show inclination towards hair and make-up are encouraged to pursue the vocation. Girls are learning how to repair mobile phones and electrical appliances. In fact, this year we have 20 girls enrolled for our appliance repair course: they repair fans, coils, etc. After school, the girls are able to earn money by utilising their skills in saree draping, make-up, manicure, pedicure, hair styling and dressing,” says Gaurav Arora, general manager, skills, Salaam Bombay Foundation. Shama Sheikh, from the same class, along with two other girls, was invited by the Tatas’ Westside store on Women’s Day for mehendi application. The girls earned Rs 600 each for five hours of work and also received gifts. These courses are aligned with the government’s National Skills Development Corporation (NSDC) and the assessment is done by third-party partners affiliated with the NSDC. A mid-term exam is conducted by the trainers while the final exam (theory and practical) is conducted by the NSDC. On successful completion of the course students get NSDC certification. This acts as an incentive for them to continue studying in school and also reduces the incidence of dropouts. According to a white paper by the Praja Foundation on the state of municipal education in Mumbai, December 2017, there was a drop of 49 percent students in class 1 from 63,392 to 32,218 students between 2015-16 and 2016-17 and the total number of students enrolled in municipal schools fell by 10 percent. Between 2012-13 and 2016-17 there has been a drop of 21 percent enrolments, that is, 90,902 students. As per SBF’s own data, 40 percent of Mumbai’s slum children will not complete their primary education and 99 percent drop out before completing the 12th grade. “With the government making education free and compulsory for children till class 7 (14 years) through the Right to Education Act, many dropouts in BMC schools happen when children reach class VIII. Out of every 100 class 1 enrollments, 80 drop out by the time they reach class 8. In class 8 when they have to appear for exams they fail as their concepts are weak; this leads to many dropouts,” says Arora. “Our research shows that income of a family of four-five people living in a slum is around Rs 9,000-Rs 10,000. There is pressure from parents on boys and girls to drop out of school and start contributing towards the family income. Children start doing menial jobs. The survey pointed out that more than 30 percent children drop out as they don’t like coming to school, as it gets boring,” he adds. The problem with these children is that they do not have mentors in their lives, explains Dipanwita Roy, manager, communications, SBF. “This is where we enter. Children drop out of school when they don’t find it interesting and parents are not able to afford extracurricular activities for them. So we introduce arts, theatre, sports, and the child looks forward to go to school and stays in school. The students give commitment to Salaam Bombay to continue their education. We understand the triggers of dropout and we work on them,” she says. Classes for most of these courses are held after school hours. SBF usually ends its intervention in class 10, when children prepare for the board exams. An orientation programme with parents is held at the start of course to address their concerns. Saddruddin Salim Hashmi, a class X student, has earned Rs 29,000 by repairing mobile phones. He has sent all the money to his mother who lives in a village. But his journey to become an independent person has not been easy. While Saddruddin was studying in class IX he wanted to enrol for a mobile repairing course being conducted in his Sion Koliwada municipal school. But his teachers refused to register him as they thought he was a naughty child. But he persisted and asked his mother to convince his teachers. Now, after 70 hours of training, he can repair all types of mobile phones including tablets. He further plans to sharpen his skills. “Salaam Bombay is helping me to enrol into a two-year apprenticeship course with Siemens at Kopar Khairane where I will earn a monthly stipend of Rs 7,500. With hands-on experience in repairing a variety of mobile phones, I feel confident of passing the test for the course,” he says. Saddruddin is also confident that after completing the course he will get admission directly into the second year at an ITI. “Currently I am repairing a Note 4 [phone]”, he says. Saddruddin’s father is a key maker and at times it becomes difficult for the family to manage their expenses. The mobile repair training course has helped Saddruddin to supplement his family income. Eighteen-year-old Sushant Khetle has also benefitted from SBF’s basic computer training and mobile repairing courses held in his school. After completing his class 10th in 2016, Sushant got admission into an ITI. But he soon dropped out of it as Siemens selected him for a two-year internship in an electrical trade course. Now in his second year of internship, Sushant earns a monthly stipend of Rs 7,500, which gets credited directly into his bank account. Once he completes the course he will get a National Council for Training in Vocational Trades (NCTVT) certificate that will qualify him for a government job. But Sushant plans to apply in Siemens or Bhabha Atomic Research Centre for a job in future. “If I had not done this course, I had no one to guide me for my future. My vocational training helped me made a clear decision on my future career,” he says. The skills@school programme provides 21st century employability skills adding value to the current education curriculum by providing trade-specific English and life skills that include critical thinking, leadership and problem solving. Students get equipped to gain part-time employment to assist their families and contribute towards their own education. Once students complete their education, they have the tools and training to enter the formal, skill-based economy or continue their education in the selected vocation. SBF has trained 2,200 children across 38 schools in Mumbai during 2017-2018. In a tie-up with Sun N Sand Hotel some students took baking lessons for 15 days. They can now bake cookies and chocolates and sell them from home. They were also taken to a centralised kitchen of a retail chain, Food Bazaar, to learn skills. The SBF also ropes in experts to give training in specialised fields like sports, arts (creative, western dance, theatre, kathak, music) and media. Those who opt for sports learn team spirit, leadership qualities and respect towards the authority. Some courses focus on artistic abilities: students are put through creative writing, painting and theatre. Many children find their voices, get noticed and discover themselves for the first time. Siddhesh Patil, who was seen in the film Hichki, auditioned for the role after a training session organised by SBF. Children are also taught leadership skills. Many students of skills training programme later become coaches and opt for ITI or polytechnics. Others who have gone through intensive cricket or western dance training work as assistant trainers and scorers. “Started four years ago, the skills@school programme has trained 3,700 children and is operational in about 40 schools in Mumbai. Our target is to train 4,000 children next year across schools in Mumbai and reach 70 schools,” says Arora. The SBF programme has a two-pronged approach. It not only imparts soft skills to children which help them in building their careers, but also helps them in fighting tobacco addiction. “Slum children have parents, siblings, uncles, aunts, cousins and peers who use tobacco. In many cases parents give tobacco to their children to supress hunger. When a child starts consuming tobacco at a very early age there are more chances of him dropping out of school,” says Roy. The SBF is spreading awareness about the ill-effects of tobacco consumption through its Super Army Project. The after-school programme requires a three-year commitment from both the child and the parent to keep the child in school and remain tobacco-free. It also offers them a chance to improve their career prospects by enabling them to pursue part-time employment while studying in school. Together with 300 BMC- and govt-aided schools and the education department, SBF has been working towards tobacco-free municipal schools in Mumbai. “Children below 10 are vulnerable. Once they are under our control and reach the age group of 12-17 they do not consume tobacco at all. Our interest is that the child stays in school because if they drop out we lose them. 80-90 percent of our children continue education,” says Roy. Three out of five Indians are unemployable due to poor skills. The National Skills Development Mission seeks to provide institutional capacity to train a minimum of 400 million skilled people by 2022. But is simply providing skills training a solution? Arora explains that there is a conflict in the country’s ecosystem and the mindset of people should change. “Western countries give high dignity and respect to different skills where drivers, plumbers, electricians and hair-stylists earn as high as software engineers, unlike here in India. Skills training focus on dropouts and have a fundamental challenge. The mindset is that skill training is for those who cannot get a job anywhere. It celebrates a dropout, whereas the education ecosystem is preventing dropouts. The skilling ecosystem has a target of 40 crore, which means they will have to pull out one child from every house for skills training to achieve their target. How a country can have two different ecosystems, both meant for repair?” he asks. He suggests that there is no need to introduce skills to dropout youth. “Instead introduce skills to the child at much younger age so that he can make an informed choice if he/she wants to pursue a particular course or profession. Education along with skills training gives a better career path. SBF believes in an integrated system where we do not see skills separate from education,” he adds. “The challenge is that a young person is not able to build a career as a school dropout after training for seven-eight months and getting a job. When you give a job to a 10th fail, this youth will want to build a career but will face blocks from employers due to lack of academic qualification. So, it is very important to introduce skills at an early age with a promise that children will not drop out of school and decide their future after finishing their 10-12th class and an academic qualification. They will have skills and perfect fit to enter job market to make a career for themselves,” says Arora.